We've got some of the biggest snowbanks now that I can remember for a long time. Maybe global warming took this winter off! Had about 10 inches of total snow and more is on the way. Latest machine in Tim's turnstile of snowblowers is this one, called a Hahn Eclipse. Most backwards design I've ever seen....the secondary auger is a two-bladed paddle, and the front auger is powered by a chain that is driven from the rear wheels! 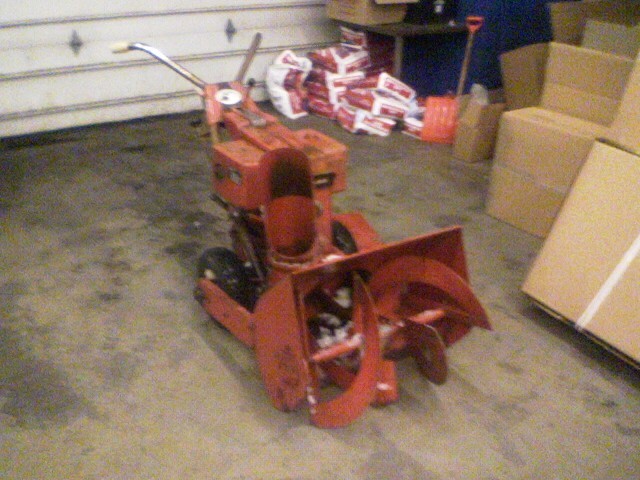 I picked this thing up and thought it was the screwiest thing I'd ever seen, but man this thing can move snow!!!! Tim! Where on earth do you find all these blowers. Some of them should be in a museum. Fun to see all the design tho. We got about 18" over the last 3 days ....and we expect 4"-6" again tonight to tomorrow. Ariens still holding up like a champ ...I must say i'm getting to use this A LOT more than I thought I would. It's one snow storm after another. Theres a blizzard warning for the morning, but the accumulation isnt suppose to be too much. Looks like more storms are slated for the week too. I want to go sledding. My 2005 did a new thing today. I woke up to 6 inches of new snow, and -18F temperature. My MDX started up no problem, and I turned on the seat heater. Half way to work I turned off the seat heater, to which the Nav lady said "Radio Off", and then the radio shut off (and no, I did not touch anything related to the voice command system). That's a new one for me. Maybe another manifestation of the radio control gremlins. The blizzard warning was a fluke. Nothing happened. Currently its -1 degrees outside, real feel of -14. Thats some weird issue. I dont know if I could hear this before, but when I switch vent modes I can hear the motorization. Not sure if this is just weather related or I am just paranoid. It doesnt sound bad at all. Prob cause it's so freaking cold out. This is the first time I had to get gas in the 5 gallon gas can, more than once. We are gettting clobbered this year and how. Couple of inches today, no biggie for the X. Tomorrow's high is predicted to be 9. TIM: you should do some before and after repair pics ...would love to see how some of those things look before you sell them after all the work. Got my hands on this Snowbird last night for $50, from Craigslist. 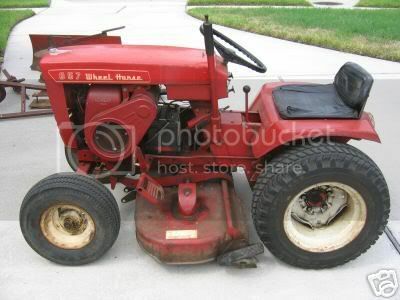 It's an S-226, but a much larger and older machine from the other S-226 I had. The guy claimed it ran great, and only needed a belt. One gentle pull and the machine came to life! Here's a shot with my cell camera, I may come in here tomorrow and turn a wrench on it and do some fine tuning. This is potentially a museum piece, it's that nice, except for the surface rust on the engine tin. Hey it's above 32 ...haven't seen that in weeks. It's both a good and bad kinda feeling ...glad for the warmer weather to melt some of the snow ...but with melting snow comes ice when it refreezes which isn't much fun when driving.